Added Adobe Photoshop CS6 and 5.1 support. Updated installer for silent installs. 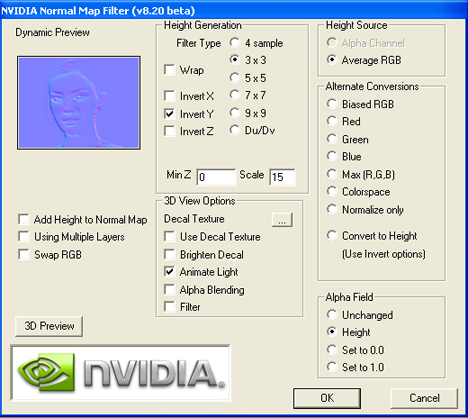 DDS export now supports PSDs with transparent layers, but without alpha channel. DDS export now supports manually added alpha channels. DXT5 export now supports volume textures. Bug fix for using DDS plugin in Corel PaintShopPro. Bug fix for mipster script that add unnecessary pixel. Bug fix for exporting DXT1 that creates alpha channels and DXT1A that does not create alpha channel. Bug fix in loading of cubemap with mipmaps. Bug fix in loading cubemap when alpha map is black on the 6th face. Bug fix in 4x4 alpha encoding. Bug fix in production, highest quality selection. 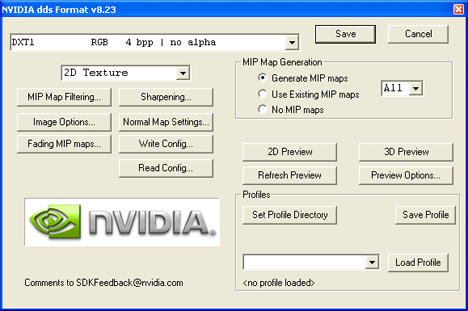 Mipster is a mip-map generation script, for Photoshop CS2 and above, that leverages the power of Photoshop’s internal image filtering engine along with the (optional) NVIDIA DDS Plug-in and Normal Map Filter (for Windows). While Mipster will function without either of these NVIDIA plug-ins (e.g., on OSX), it works best in tandem with them. Running Mipster on any image will create a collection of mip-map layers in your current Photoshop document -- one layer per MIP.